There’s a place where all devout pinot-philes go. No – it’s not heaven (the golden slopes of Burgundy) or hell (where MegaPurple flows from the faucets). It’s the International Pinot Noir Celebration, colloquially IPNC, and widely recognized as the one annual pinot noir event to not miss. Affectionately and affirmably a Celebration (rather than a conference, forum, festival or event), the festive July event brings consumers, winemakers, sommeliers and pinot fans from around the globe to the campus of Linfield College in McMinneville, Oregon, for weekend of sharing and learning. The historic school, an easy one hour drive southwest of Portland and in the heart of the Willamette Valley, has become the traditional home of IPNC, a fitting venue for the scholarly seminars, proximity to vineyards and convenient accommodation in dorms for the hundreds of attendees from around the world. The 2014 edition marked the IPNC’s 28th year, and major plans are already in the works for 2015’s event which will celebrate the 50th anniversary of pinot noir in the Willamette Valley. During this year’s gathering, next year’s anniversary discussions were as hot as the temperatures (hovering around 30C). The vision of IPNC began, as many good ideas do, over wine. In late 1985, an informal group of like-minded Oregon wine geeks, winemakers, restaurateurs and retailers envisioned a premier wine event, to be held in the core of Oregon wine country. The first event was held in 1987, and it has grown and matured each year since. In 2014, the weekend welcomed approximately 800 registered attendees, including more than 140 representatives from 73 featured wineries. For Sunday evening’s main event, the legendary Northwest Salmon Bake, hundreds more arrive, many with stocked coolers in tow, for this long-standing gastronomic feast – one of America’s top dinners. It’s worth repeating that this is not your average consumer event; the knowledge level of attendees, service staff (all sommeliers) and presenters is extremely high. Past speakers have included Jancis Robinson, Robert Parker, Michael Broadbent, Dominique Lafon and more luminaries. This year featured one such luminary who needs no introduction to this column. 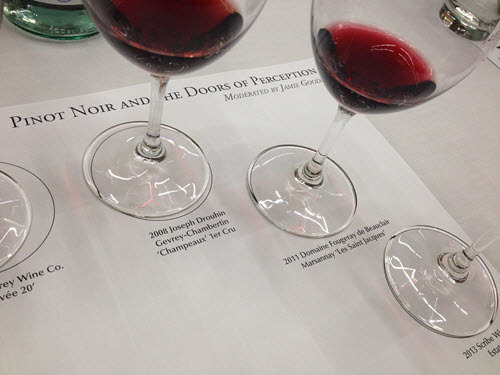 Honourary WineAlign member, Dr. Jamie Goode, – who judged with us at the National Wine Awards of Canada in June – moderated the Grand Seminar, investigating the theme of Pinot Noir and the Doors of Perception. It’s a topic of particular interest to me, as a wine journalist trying to clearly articulate my thoughts on wine in a way that readers, amateur and advanced, can relate to. If I write apples and someone else tastes pears, are we off page? Or is my apple, his pear? Is my ‘juicy and grippy’ her ‘acidic and tannic’? Is this the conversation we should even be having? Turns out I’m not the only one grappling with these thoughts, as Dr. Goode, one of the world’s leading wine journalists, admitted to the same questions himself. He skillfully introduced a shining panel of professionals from around the world who each described how they relate wines that speak to them. I was particularly interested in hearing Elaine Brown, the award-winning wine-writing philosopher and poet behind the popular Hawk Hakawaka Wine Reviews website. She expresses tasting notes as hand drawings, expressing how wines affect her through visuals, rather than words. Can art be something we can all relate to, rather than fruit, or tannin, or acid, or other geeky wine vocabulary? Are there ways I can improve on sharing the message about a wine? That’s just one example of how my wine world expanded at IPNC. A University of Pinot seminar on Loire Valley Pinot Noir led by newly pinned Master Sommelier Pascaline Lepeltier was outstanding. The lauded somm of New York’s Michelin-starred pinnacle for vin naturel, Rouge Tomate was born and raised in the Loire, and her understanding of the region, and the characterful wines made sustainably and authentically was fascinating. Similarly, a seminar with Dr. Jordi Ballester about The Aroma of Colour was a fantastic learning adventure A sensory scientist at the Université de Bourgogne, Dijon, he has devoted his academic career to exploring the question of how does one smell colour. The group were presented with wines in black glasses, and had to determine which was white, red and rose – a task much trickier than it sounds! Fortunately, I nailed the tasting (I credit the wine judging circuit) but most of the people in the room faltered. A fascinating experience illustrating how much our eyes perceive what we taste. 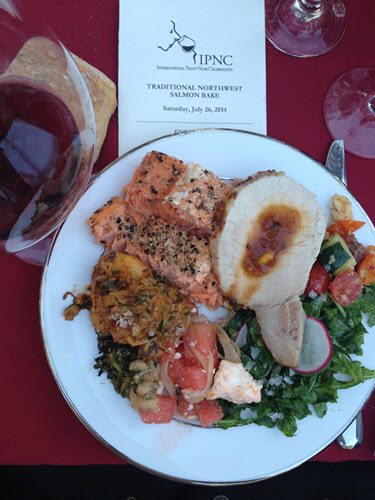 As mentioned, the grand Salmon Bake is the culmination of a full schedule of seminars, walk about tastings, lunches, discoveries and connections. That Saturday evening, as I feasted on an alfresco buffet of wild salmon roasted on alder stakes, local vegetables, salads, breads and too much more deliciousness to remember (all prepared by respected Oregon chefs), I clinked glasses with new and old friends and tasted dozens of wines from the IPNC library and personal cellars from around the globe. I was struck by the fact that we all came together to enjoy, rather Celebrate, pinot noir. Sometimes words, pictures, visuals, tasting notes and specs aren’t important – we were all united for our love of wine. This year 73 pinot noir producers were featured, hailing from Alsace, Argentina, Burgundy, California, Germany, Italy, New Zealand, Oregon, Washington plus one from Canada – Mission Hill Family Estate. The following dozen pinot picks are from tastings over past year (including medalists from the 2014 National Wine Awards of Canada).